For most users, everything worked fine, but for many organizations working behind a proxy solution such as Forefront TMG, it was impossible to log in. Older versions, such as Live Messenger 2009 did not have these login problems, only Live Messenger 2011. 1. 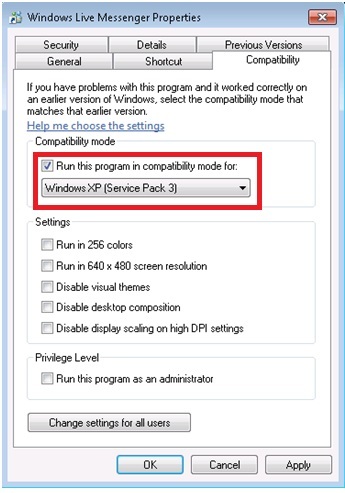 There was no way to log in to Live Messenger 2011 when working from an environment with a proxy solution, but once a successful login is made (without a proxy) the problem disappears. I logged in normally using a workstation that was not going through the corporate proxy, and then when trying to log in again using a proxy server, it worked fine. I realized there was a process trying to send user credentials only on the first logon attempt. Once the credentials were authenticated, this process would no longer be started. 2. 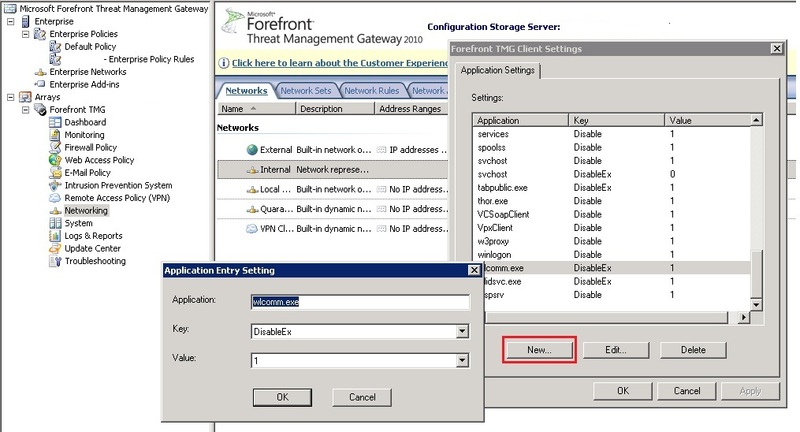 When testing access using a workstation with the Forefront TMG Firewall Client, we could see several exe files appear in the Forefront TMG logs. These files were msnmsgr.exe, VCSoapClient, VpxClient and wlcomm.exe. Our first troubleshooting step was to create an access rule in Forefront TMG allowing user access to Live Messenger websites. For this we created a Domain Set called that included *.msn.com, *.hotmail.com and *.live.com. We then created an access rule to allow the Internal Network to the Domain Set. 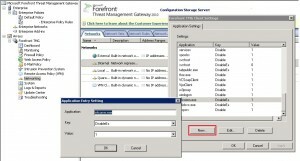 To isolate files in Forefront TMG, go to “Networks” and “Forefront TMG Client Settings” on the right pane. After following all the steps above, I got back to my workstation to make another attempt but it failed again! My next step was to better understand how the Live Messenger EXE files were connecting through Forefront TMG. For this we used the TCPView tool. TCPView collects all network traffic from a workstation or server to understand where connections start and finish. As you can see, the WLIDSVC.EXE file establishes a connection to the Forefront TMG Server, but for some reason it does not complete the three-way-handshake and tries to bypass the proxy server. 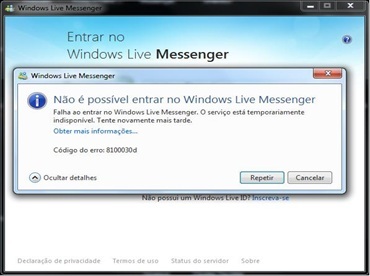 We had a separate edge firewall blocking Internet access that was not from the Forefront TMG IP address, and as this exe was trying to access the internet directly, it failed to send the Windows Live Messenger login credentials. As a workaround, a rule was created on the edge firewall allowing traffic from the WLIDSVC.EXE to the IP address range of the Live Messenger Servers (65.54.0.0 to 65.54.255.255) in order to send the first time credentials. It was a temporary solution until I could find a better way to connect new users to Live Messenger 2011. Once this change was made, the Live Messenger login succeeded! With the problem temporarily fixed, I started a TechNet forum thread with some colleagues here in Brazil who had the same problem. After some time discussing (unfortunately in portuguese), we found a definitive workaround for this issue. All these tests were done with a workstation using the Forefront TMG Firewall client but the same problem will occurs on workstations connecting by webproxy. 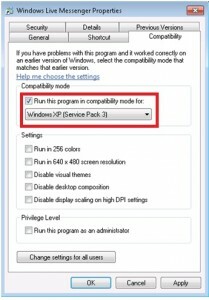 Changing the compatibility mode will also solve the problem in this scenario. If you have also encountered this issue and solved it a different way, please let us know in the comments below.